Merrill Stewart is primarily known for his fish and his roosters - each one with its own distinct personality. Because of a disability, Merrill's output was limited over the years and not much of his work was available to the public. He did no carving at all over the winter of 2000/2001 and he stopped carving in 2003. Because of this he was not accorded the exposure and recognition that he truly deserved. 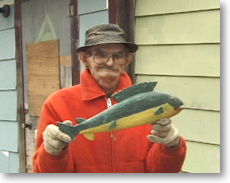 Merrill Stewart's fish, each one unique in shape and coloring, stand on old cod hooks that have had their points cut off. 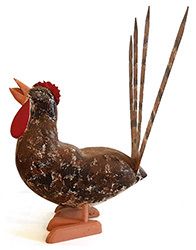 His roosters, fashioned of wood with metal tails cut from old bedsprings, are some of the most original to be found in eastern Canada.